Mothers Ultra Soft Edgeless Polishing Cloth is made of super soft microfiber - remove waxes & polishes without scratching! The Mother of all polishing cloths! It’s been a long time coming, but Mothers finally has their own microfiber polishing cloth. 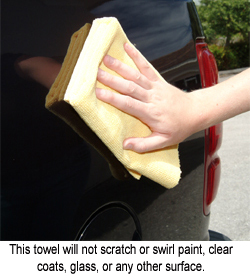 What better item is there to compliment their quality waxes and polishes than an ultra soft microfiber towel? Mothers uses patented ultra soft technology to create a surface-friendly polishing cloth for wax and polish removal. The cloth grips the surface to effectively remove dried products without getting them caked in its fibers. Even Mothers own paste waxes will wipe away easily! Use Mothers Ultra Soft Polishing Cloth to buff away any wax; from Mothers California Gold Carnauba Paste Wax, which dries to a white haze, to Pinnacle Souveran™ Carnauba Paste Wax, which buffs off wet. The special polishing texture makes buffing easy! When it comes to washing your Mothers Ultra Soft Polishing Cloth, use Pinnacle Micro Rejuvenator. This gentle, clean-rinsing detergent removes product residues and leaves microfiber feeling like new. Avoid fabric softener and bleach, and dry on low heat. Buff smarter with Mothers Ultra Soft Polishing Cloth. Nice little towel, not super plush, just perfect for removing wax/polish. I found this towel the perfect thickness for getting into those tiny cervices where body panels meet; I did use a large dulled wire tie as a tool for a more focused approach into these cervices. A few more of these are on my shopping list.